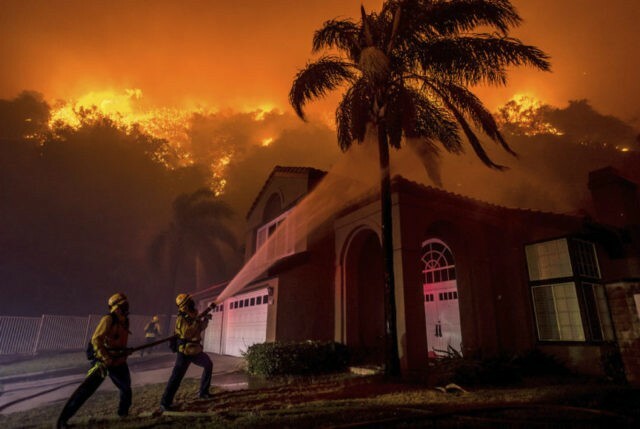 CORONA, Calif. (AP) — Firefighters hosed down blazing trees within a few feet of homes threatened by a wildfire that surged through suburban canyons in Southern California and sent hundreds of people scrambling for safety. One residence was damaged Monday before shifting winds sent flames away from neighborhoods in and around Corona, about 50 miles southeast of Los Angeles. At the height of the fire, flames climbed hillsides along a partially closed freeway. Schools were closed Tuesday and at least 500 homes remained under evacuation orders. Authorities were hopeful some residents would be allowed to return later in the day, but that depended on the behavior of gusty, dry winds moving through the region amid an early autumn heat wave. “We know it’s going to get hotter and dryer. With these weather conditions, things can change very quickly out there,” said Capt. Steve Concialdi of the Orange County Fire Authority. He said homes were saved by crews on three helicopters equipped with night vision technology to help them make water drops after dark along steep hillsides. After sunrise, six more aircraft, including planes, joined the fight. The fire sent up a huge plume of smoke and rained ash as it swiftly grew to more than 3 square miles (7.7 sq. kilometers) after starting early Monday afternoon. It was just 5 percent contained. Smoke drifted some 40 miles (64 kilometers) west to the ocean and authorities warned of potentially dangerous air quality. Fast-moving firefighters climbed onto roofs to sweep away embers, keeping damage to a minimum as over 1,000 people evacuated during the height of the fire. Jeff Peterson of Corona arrived at his home of 17 years about two hours after the fire began. The wind appeared to be blowing flames away from his house as he watched with a neighbor. Then the wind changed, and so did his mood. “We just looked at each other and said, ‘it’s time to go get the valuables,'” Peterson told the Orange County Register. Flames crept down hillsides to the shoulder of State Route 91. The freeway acted as a fire line and blocked the spread of the fire. But with some lanes closed, traffic was backed up for several miles and delays continued through the morning commute. The fire burned as temperatures across the state spiked during the ongoing heat wave. Some areas in Northern California could see heat in the mid-90s. In San Francisco, public libraries, community centers and public swimming pools will serve as cooling centers through Thursday.